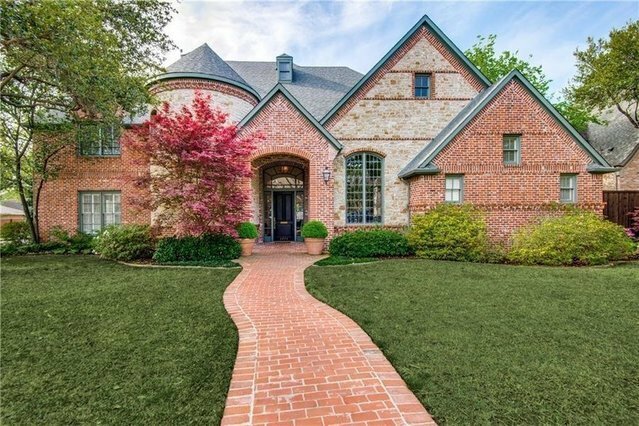 Lovely traditional on oversized 100x150 corner lot in the heart of Preston Hollow. Recently updated w ebony-stained floors, new hardware throughout, designer wallpapers, & new designer powder bath. Gracious 2-story entry leads to formal living anchored by fireplace. Kitchen opens to breakfast room & overlooks 2-story family room w wet bar & wine storage. 1st-floor master suite features spacious bath w dual sinks, separate shower & expansive his-and-her closets. Additional 1st-floor guest suite. Well-appointed children's bedrooms done by MADRE - upstairs features 3 spacious en suite bedrooms. Playroom w Juliette balcony overlooks family room; spacious theater room w wet bar over attached 3-car garage.